This specification defines the performance of rechargeable LiFePO4 battery pack TB4820F -T110D manufactured by TOPBAND NEW ENERGY CO.,LTD, describes the type, performance, technical characteristics, warning and caution of the battery pack. Testing Conditions: Ambient Temperature: 25±5℃; Huminity:45%~75%. Normal charge: Charge battery under CC(0.33C)/CV(58.4V) mode until over charge protection or the charge current reduce to 0.05C, and then rest for 1h. 3.1 Normal Capacity 20Ah After Normal charge, discharge @0.33C current to the end of discharge voltage. 3.2 Internal Impedance ≤40mΩ @50% SOC @1kHz AC internal resistance test instrument. 3.3 Short circuit protection Auto cutoff load when short circuit Connect the positive and negative of this battery pack through a lead with 0.1Ω resistance. 3.4 Cycle life @DOD100% ≥2000 cycles After Normal charge,discharge @0.33C current to the end of discharge voltage. Repeat above process until discharge capacity reduces to 80% of initial value. The batteries are supplied with a LiFePO4 Battery Management System (BMS)that can monitor and optimized each single prismatic cell during charge & discharge, to protect the battery pack overcharge, over discharge, short circuit. Overall, the BMS helps to ensure safe and accurate running. Input 220Vac, after rectification power module, output 48V. When the power grid normal, the battery will supply power according to system requirement, and to be charged at same time; when power off, the battery will supply energy, to make sure the DC power system working normally, to realize uninterruptible power supply. 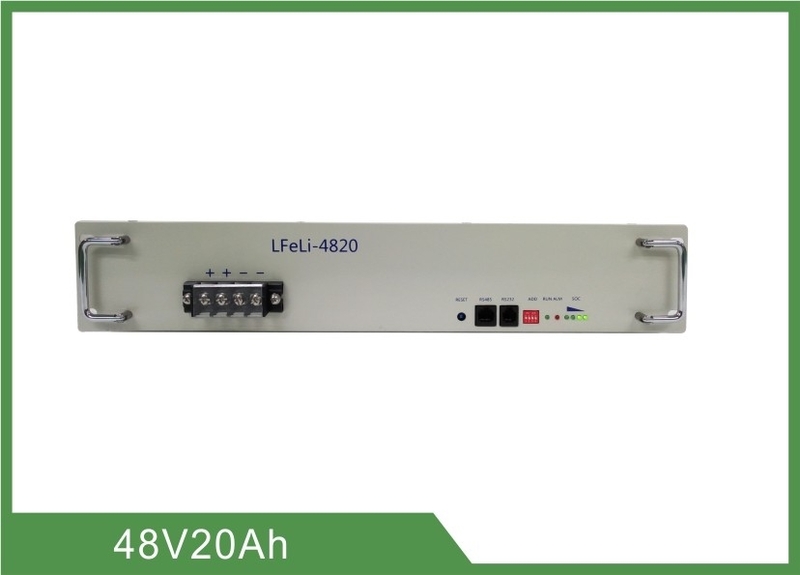 The power supply has second disconnection function, when the battery voltage is low, the battery output would be cut off to protect battery life. The minimum single voltage lower than sleep voltage and the lasting time reach sleep delay time (no communication, no protection, no balance, and no current at same time). Standby more than 24h( no communication, no charge or discharge, no AC input). Force shutdown through upper-computer software. Before sleep mode, please make sure there is no input voltage, otherwise it can no go to sleep mode. Connect to charger, and the charger output is more than 48V. Connect to communication cable, open upper computer software ( if it goes to sleep mode due to over discharge protection, this method would not wake up the circuit board). Remark: single model or the whole system goes to low-consumption mode after over discharge protection, it would be wake-up every 4hs, to open discharge MOS. If it can be charged, it would exit sleep mode and start normal charge; if it fails to be charged after 10times of wake-up automatically, there would be no automatic wake-up. No fall down, no pile up over 6 layers and keep face up. Please read and follow the handling instructions before use. Improper use may cause heat, fire, rupture, and damage or capacity deterioration of the battery. TOPBAND NEW ENERGY CO.,LTD. Describes is not responsible for any accidents caused by the usage without following our handling instructions. * Battery must be far away from heat source, high voltage, and no exposed in sunshine for long time. * Never disassemble the battery without manufacturer's permission and guidance. * Keep the battery against high temperature. Otherwise it will cause battery heat, get into fire or lose some function and reduce the life. * When battery run out of power, please charge your battery timely (≤15day). * Please use the matched or suggested charger for this battery. * If battery emit peculiar smell, heating, distortion or appear any abnormity, please stop using. * If the battery leaks and get into the eyes or skin, do not wipe, instead, rinse it with clean water and see doctor immediately. * Please far away from children or pets. * It is strictly prohibited any series between the battery packs. Any requirements on serials connection, please contact TOPBAND for details.